(i) The question paper comprises of two sections, A and B. You are to attempt both the sections. (iii) All questions of Section A and all questions of Section B are to be attempted separately. (iv) Questions number 1 to 3 in Section A are one mark questions. These are to be answered in one word or one sentence. (v) Questions number 4 to 6 in Section A are two mark questions. These are to be answered in about 30 words each. (vi) Questions number 7 to 18 in Section A are three mark questions. These are to be answered in about 50 words each. (vii) Questions number 19 to 24 in Section A are five mark questions. These are to be answered in about 70 words each. (viii) Questions number 25 to 36 in Section B are multiple choice questions based on practical skills. Each question is a one mark question. You are to select one most appropriate response out of the four provided to you. Q.1 Write the number of covalent bonds in the molecule of propane C3H8. Sol: The number of covalent bond in the molecule of propane C3H8 is 10. Q.2 Where is DNA found in a cell? Sol: DNA is found inside nucleus of the cell. Q.3 The first trophic level in a food chain is always a green plant. Why? Sol: The first trophic level in a food chain is always a green plant because the green plant is the primary producer by trapping energy from sunlight. Q.4 The absolute refractive indices of glass and water are 4/3 and 3/2 respectively. If the speed of light in glass is 2 × 108 m/s, calculate the speed of light in (i) Vacuum (ii) Water. The speed of light in vacuum c = 2.67× 108 m/s Ans. The speed of light in water (vw) = 2c/3 = 1.78 ×108 m/s Ans. Q.5 We often observe domestic waste decomposing in the bylanes of our homes. List four ways to make the residents aware that the improper disposal of wastes is harmful to the environment and also for their own health. (c) It will degrade the soil fertility. (d) It will release harmful greenhouse gases that pollute air we breathe. Q.6 List any two advantages associated with water stored in the ground. (1) It does not evaporate, but spreads out to recharge wells and gives moisture for vegetation over a wide area. (2) It does not provide breeding grounds for mosquitoes like stagnant water collected in ponds or artificial lakes. The ground-water is also relatively protected from contamination by human and animal waste. Q.7 What is meant by homologous series of carbon compounds? Classify the following carbon compounds into two homologous series and name them. Sol: A carbon series compounds, in which the same functional group substitutes for hydrogen in a carbon chain is called a homologous series. Q.8 List two tests for experimentally distinguishing between an alcohol and a carboxylic acid and describe how these tests are performed. Sol: Test first: Take 1 g of sodium carbonate in two test tubes A and B. Pour alcohol in test tube A and carboxylic acid in test tube B. Shake the contents of the test tubes. The test tube in which no reaction takes place is alcohol. The test tube in which a brisk effervescence takes place, with the liberation of a colourless gas (CO2) is carboxylic acid. Test Second: If you add a small piece of Na metal into a test tube containing alcohol, you get to see the formation of bubbles. This is due to the release of a gas which we call as hydrogen. Carboxylic acid remains unsuccessful to show this test. (i) In which group should they be ? (ii) Which one of them is least reactive? (iii) Which one of them has the largest atomic size? (c) Ca : It has 4 no of shell. -Q.10 Taking the example of an element of atomic number 16, explain how the electronic configuration of the atom of an element relates to its position in the modern periodic table and how valency of an element is calculated on the basis of its atomic number. Q.11 List three distinguishing features between sexual and asexual types of reproduction, in tabular form. 1. It involves no formation and fusion of gametes. 1. It involves formation and fusion of gametes. 2. It is uniparental. 2. It is parental. 3. Reproductive units are somatic cells of parent. 3. Reproductive units are germs cells of parent. Q.12 List four points of significance of reproductive health in a society. Name any two areas related to reproductive health which have improved over the past 50 years in our country. (i) Birth control methods and family planning measures. (ii) Sexually transmitted diseases and their methods of prevention. (iii) Importance of breastfeeding and postnatal care for the mother and baby. (ii) Maternal and infant mortality rate, which has been decreased drastically due to better postnatal care. (iii) Family planning, which has motivated people to have smaller families. (iv) Use of contraceptive, which has resulted in a decrease in the rate of sexually transmitted diseases and unwanted pregnancies. Q.13 What are chromosomes? Explain how in sexually reproducing organisms the number of chromosomes in the progeny is maintained. Sol: Chromosomes are thread like structure made up of DNA and proteins. They are present inside the nucleus. Gamete formation is the first step in sexual reproduction. Number of chromosomes is halved during gamete formation. As a result, the number of chromosomes in gamete is half the number of chromosomes in somatic cells. When male and female gametes fuse during fertilization, the number of chromosomes becomes equal to that in somatic cells. In this way number of chromosomes is maintained in the progeny. Q.14 A pea plant with blue colour flower denoted by BB is cross - bred with a pea plant with white flower denoted by ww. (a) What is the expected colour of the flowers in their F1 progeny ? (b) What will be the percentage of plants bearing white flower in F2 generation, when the flowers of F1 plants were selfed? (c) State the expected ratio of the genotype BB and Bw in the F2 progeny. Sol: (a) In the F1 generation, The colour of the flower would be blue as gene for blue colour is dominant over white. (b) In the F2 generation,the percentage of white flowers would be 25%. Sol: (a) Speciation: The process in which one or more species arise from previously existing species. A single species may give rise to a new species or two different species may give rise to a new species. (b) Natural selection: A basic mechanism of evolution in which nature selects the characteristics of an organism. If the behavior of a certain organism is approved by nature, the organism will survive or else will die, hence not selected by nature. Q.16 What is meant by scattering of light? Use this phenomenon to explain why the clear sky appears blue or the sun appears reddish at sunrise. Sol: When a beam of light strikes fine particles get reflected in different direction by these particles, is called the scattering of light . When sunlight passes through the atmosphere, the fine particles in air scatter the blue colour (shorter wavelengths)more strongly than red. The scattered blue light enters our eyes. thus clear sky appear blue. During sunrise and sunset, the rays have to travel a larger part of the atmosphere because they are very close to the horizon. Therefore, light other than red is mostly scattered away. Most of the red light, which is the least scattered, enters our eyes. Hence, the sun and the sky appear red. Q.17 If the image formed by a mirror for all positions of the object placed in front of it is always erect and diminished, what type of mirror is it? Draw a ray diagram to justify your answer. Where and why do we generally use this type of mirror? Convex mirrors are commonly used as rear-view (wing) mirrors in vehicles. Convex mirrors are preferred because they always give an erect, though diminished, image. Also, they have a wider field of view as they are curved outwards. Thus, convex mirrors enable the driver to view much larger area than would be possible with a plane mirror. Q.18 What is an ecosystem? List its two main components. We do not clean natural ponds or lakes but an aquarium needs to be cleaned regularly. Why is it so? Explain. Sol: All the interacting organisms in an area together with the non-living constituents of the environment form an ecosystem. Biotic and Non biotic Component. An aquarium needs to clean regularly due to lack of decomposers that can clean naturally by decomposing organic substance. Q.19 What are fossils ? How are they formed? Describe in brief two methods of determining the age of fossils. State any one role of fossils in the study of the process of evolution. Sol: Fossils may be defined as the remains of the organisms which have been preserved in the form of molds or cast in rocks etc. since prehistoric ages. When a plant or an animals dies, their remains falls on the ground. Over a period of time their body gets covered by sediments brought by rivers, winds etc. These sediments keeps on getting accumulated for over hundred of years and when that land gets eroded, the fossils can be seen Thus, the process of accumulation of dead remains of plants and animals for over hundreds of years results in the formation of fossils. (1) Radiometric dating: In this method, the age of the fossil can be determined by tracing the radioactive elements present in the rocks and examining it chemically. (2) Relative dating: The fossils are found in the sedimentary rocks in the form of layers accumulated over large span of time. So, using this fact, the geologist find the age of fossils in the way that the fossil found at the bottom of those layers are found to be older than that found above those. Analysis of the organ structure in fossils allows us to make estimates of how far back evolutionary relationships go. Q.20 (a) Name the human male reproductive organ that produces sperms and also secretes a hormone. Write the functions of the secreted hormone. (ii) Implantation of the fertilised egg occurs. 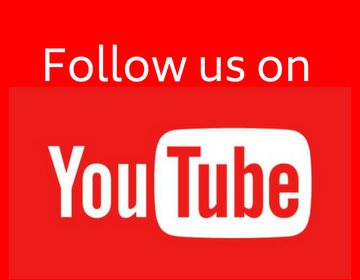 Explain how the embryo gets nourishment inside the mother’s body. Sol: (a) The formation of germ-cells or sperms takes place in the testes. The hormone testosterone is secreted by the testes This hormones help in regulating the formation of sperms and brings about changes in appearance seen in boys at the time of puberty. The embryo gets nutrition from the mother’s blood with the help of a special tissue called placenta. This is a disc which is embedded in the uterine wall. It contains villi on the embryo’s side of the tissue. On the mother’s side are blood spaces, which surround the villi. This provides a large surface area for glucose and oxygen to pass from the mother to the embryo. Q.21 What is meant by power of a lens? Define its S.I. unit. You have two lenses A and B of focal lengths + 10 cm and - 10 cm respectively. State the nature and power of each lens. Which of the two lenses will form a virtual and magnified image of an object placed 8 cm from the lens? Draw a ray diagram to justify your answer. The S.I unit of power of a lens is ‘dioptre’. It is denoted by the letter D.
Lens A is convex and B is concave Convex lens form virtual and magnified image, if object placed between f and O.
Q.22 Write the importance of ciliary muscles in the human eye. Name the defect of vision that arises due to gradual weakening of the ciliary muscles in old age. What type of lenses are required by the persons suffering from this defect to see the objects clearly? Akshay, sitting in the last row in his class, could not see clearly the words written on the blackboard. When the teacher noticed it, he announced if any student sitting in the front row could volunteer to exchange his seat with Akshay. Salman immediately agreed to exchange his seat with akshay. He could now see the words written on the blackboard clearly. The teacher thought it fit to send the message to Akshay’s parents advising them to get his eyesight checked. (i) Which defect of vision is akshay suffering from ? Which type of lens is used to correct this defect? (iii) In your opinion, in what way can akshay express his gratitude towards the teacher and salman? Sol: Cilliary muscles adjust the focal length of eye lens.this property is known as power of accommodation. Presbyopia arises due to the gradual weakening of the ciliary muscles and diminishing flexibility of the eye lens as increasing of age of human. A common type of bi-focal lenses consists of both concave and convex lens are required to see the object clearly. Q.23 One half of a convex lens of focal length 10 cm is covered with a black paper. Can such a lens produce an image of a complete object placed at distance of 30 cm from the lens? Draw a ray diagram to justify your answer. A 4 cm tall object is placed perpendicular to the principal axis of a convex lens of focal length 20 cm. The distance of the object from the lens is 15 cm. Find the nature, position and size of the image. m = hi/ho = 16/4 = 4 ⇒ Positive sign shows that image is erect and magnified. Q.24 Both soap and detergent are some type of salts. What is the difference between them? Describe in brief the cleansing action of soap. Why do soaps not form lather in hard water? List two problems that arise due to the use of detergents instead of soaps. (i) sodium salt of long chain carboxylic acid. (i) Ammonium or sulphate of long chain of carboxylic acid. (b) When dirty clothes are mixed with water and soap, the ionic part of the soap being water attractive, dissolves in water whereas the hydrocarbon part of the soap being water repellent unites with the oil or grease part. When dirty clothes are rinsed with water, the dirt particles attached with the soap molecules, dissolve in water and come out. In this way, clothes become clean. (c) In hard water, due to the presence of Ca+2 and Mg+2 ions, soaps form insoluble salt. This Precipitate is called scum. (i) Being non-biodegradable, they accumulate in the environment causing pollution. (ii) In soil this leads to pH changes making soil infertile. Q.27 A student traces the path of a ray of light through a triangular glass prism for different values of angle of incidence. On analysing the ray diagrams, which one of the following conclusions is he likely to draw? (a) The emergent ray is parallel to the incident ray. 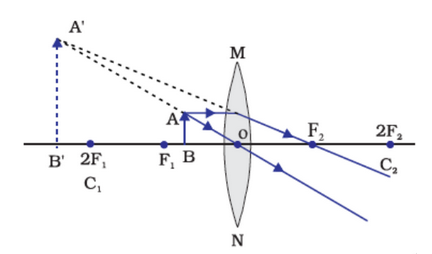 (b) The emergent ray bends at an angle to the direction of the incident ray. (c) The emergent ray and the refracted ray are at right angles to each other. (d) The emergent ray is perpendicular to the incident ray. 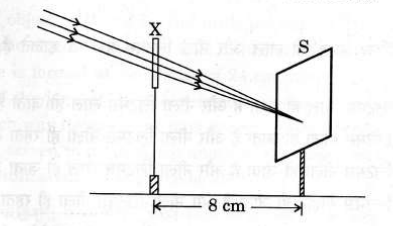 Q.28 A student traces the path of a ray of light through a rectangular glass slab for the different values of angles of incidence. He observes all possible precautions at each step of the experiment. At the end of the experiment, on analysing the measurements, which of the following conclusions is he likely to draw? Q.29 A student obtains a sharp image of the distant window (W) of the school laboratory on the screen (S) using the given concave mirror (M) to determine its focal length. Which of the following distances should he measure to get focal length of the mirror? Q.30 A student used a device (X) to obtain /focus the image of a well illuminated distant building on a screen (S) as shown below in the diagram. Select the correct statement about the device (X). Q.31 A student takes about 4 mL of distilled water in four test tubes marked P, Q, R and S. He then dissolves in each test tube an equal amount of one salt in one test tube, namely sodium sulphate in P, potassium sulphate in Q, calcium sulphate in R and magnesium sulphate in S. After that he adds an equal amount of soap solution in each test tube. On shaking each of these test tubes well, he observes a good amount of lather (foam) in the test tubes marked. Q.33 While preparing soap a small quantity of common salt is generally added to the reaction mixture of vegetable oil and sodium hydroxide. Which one of the following may be the purpose of adding common salt? Q.34 A 4 cm tall object is placed on the principal axis of a convex lens. The distance of the object from the optical centre of the lens is 12 cm and its sharp image is formed at a distance of 24 cm from it on a screen on the other side of the lens. If the object is now moved a little away from the lens, in which way (towards the lens or away from the lens) will he have to move the screen to get a sharp image of the object on it again? How will the magnification of the image be affected? Q.35 When you add sodium hydrogen carbonate to acetic acid in a test tube, a gas liberates immediately with a brisk effervescence. Name this gas. Describe the method of testing this gas. On passing CO2 gas through lime water, the lime water turns milky. The milky appearance of lime water is due to the formation of solid calcium carbonate (CaCO3). Q.36 Students were asked to observe the permanent slides showing different stages of budding in yeast under high power of a microscope. In section B, the answers for 25th and 26th questions are not correct. The answers and the options are mismatched. Please make a note of it and change them as soon as possible. Otherwise the answer parts given are awesome. The answers were really nice with appropriate explanation.